Like Leon Gast’s great ‘When We Were Kings’ documentary about the Rumble in The Jungle fight, it took 20 years after the event for the film to be completed. Well, a documentary on the accompanying music festival, has finally surfaced as well – an energetic instant classic as memorable as some of the greats music documentaries of its era, Gimme Shelter, Woodstock, and Monterey Pop. Everything from the organization of the event to performances is covered with superb camerawork which appears to be everywhere at once, so why did it take so long to bring this great story and footage to the screen? Did the footage sit in someone’s basement waiting to be edited? Unfortunately the DVD doesn’t enlighten us on the making of the film, so we just have to assume some legal and financing issues prevented the film some seeing the light of day until now. As background, the bombastic fight promoter Don King, sought not only to create the greatest boxing match spectacle in the world, but in the spirit of black pride adjoin it to an equally spectacular 3-day music festival featuring an international array of Afro-American, African and Caribbean performers. King and fellow promoter Stewart Levine gathered an army of (film) cameras, cameramen and sound men to chart this event from its coordination in New York, the flight across the Atlantic, the great musical performances and its big picture effect on the Zairian people. Music is everywhere in this picture - the stage, the streets, the airport. Even on the airplane, a sequence which could have made its own movie. The 13 hour flight from NYC to Zaire, featuring impromptu performances and instrument players in the seats of their plane is simply magical. After watching from a verite perspective some of the hiccups it took to get everything set up logistically, at the 35mins mark the music starts. While not everyone we see are household names, each one has a distinct soulful and contributes to the energetic feeling of black pride. The opening act, The Spinners, perform a fun and funky diddy complete with 6 part Motown-style choreography. The click song sung by Miriam Makeba, a South African woman singing in the native language which uses a clicking sounds generated by her mouth as part of her speech. BB King’s ‘Thrill is Gone’ has never ever sounded bouncier or funkier, and Celia Cruz’s Latino Cuban beats is exhilarating. 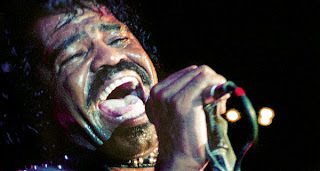 And of course, James Brown, the hardest working man in show business, is at his creative peak. If anything, I wished there were more superimposed titles telling us who we were watching and listening to. Other than Ali, Brown, BB King and a few others like George Plimpton, to ignorant eyes, they are just strangers. But during the credits we do get a recapped picture titles letting us in on the names of everyone we just saw. With black pride is in full force, between James Brown, Ali, King and the others expounding joyously on the significance of ‘returning’ to their roots, watching the film with 30 years of hindsight adds even greater context knowing of the plight of African nations like Zaire, through the famine, Aids and the irresponsibility of leaders like Mobutu Sese Seko.